Having a kitchen faucet which is stylish yet durable is something most homeowners desire. Most people think choosing a faucet should be simple, however there are so many factors you need to consider to get the best kitchen faucet for your home. Whether you use it for washing your hands, preparing food or simply to wash the dishes, the kitchen faucet is a very important piece of equipment in every household. There are many different styles of faucets to choose from, so if you’re worried about finding one which will look good in your kitchen, you’ll be spoilt for choice. No matter how much you choose to spend on a faucet, it’s vital that you do your research and check out some kitchen faucet reviews before buying one. The best kitchen faucet will be able to cope with a tremendous amount of wear and tear, so if you spend a bit more, you’re probably going to get better quality. Due to the high levels of usage, poor quality faucets can unfortunately begin to encounter some issues, such as leakages and other plumbing related issues, hence why reading kitchen faucet reviews is so vital! The best kitchen faucets have dramatically changed over the years, with the use of pull-down and pull-out spout heads allowing you to extend the hose freely and allow more pressure to target certain areas. 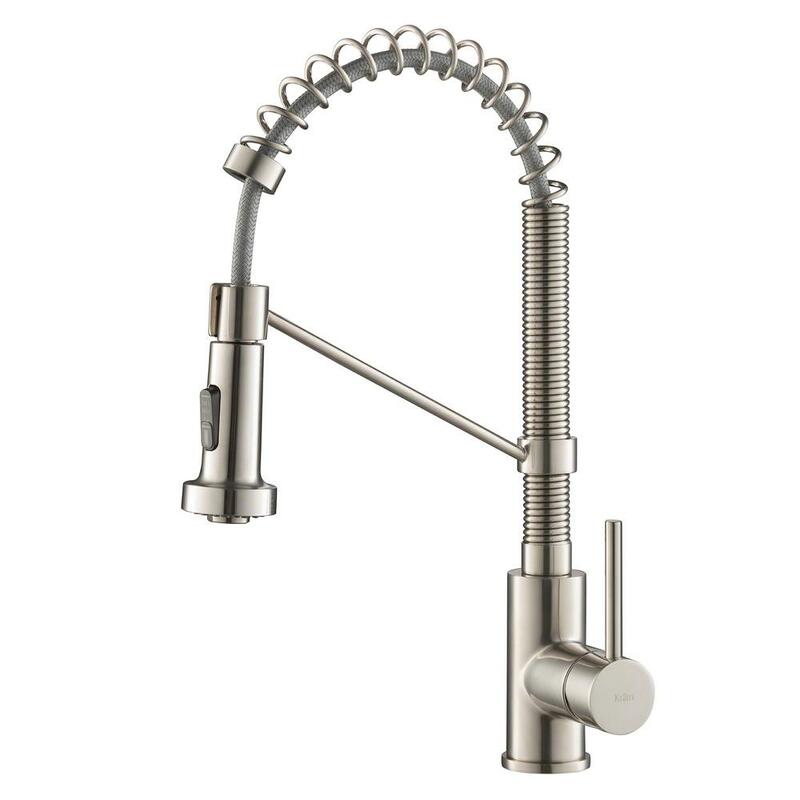 If you’re looking for a simplistic-looking faucet that has lots of great features, look no further than the Kohler K-596-VS. Like most good quality faucets, the K-596-VS comes with a large hose, expanding an impressive 68 inches. It also comes with the DockNetik system which makes docking the spray head back to its place, a simple and effortless task. Thanks to Kohler’s innovative ProMotion technology, the spray head can be moved 360 degrees. Delta have created a powerful faucet with the Delta 9178-AR-DST, which has some fantastic features on it. One of the most impressive features being the MagnaTite docking which allows the spray to snap perfectly into place when it’s not being used. It comes with diamond seal protection which is pretty impressive considering the price, and it’s also ADA compliant. Moen’s 5923SRS comes with Spot Resistant technology meaning it’s splash and dirt resistant, so you won’t have to be cleaning it all the time! If water marks are a pet hate of yours, we recommend you check this model out! It’s one of Moen’s most powerful faucets, claiming to produce 50% more spray power than other pull out faucets, pretty impressive!! The 68inch hose means the user can have complete flexibility whilst doing tasks such as washing dishes too. 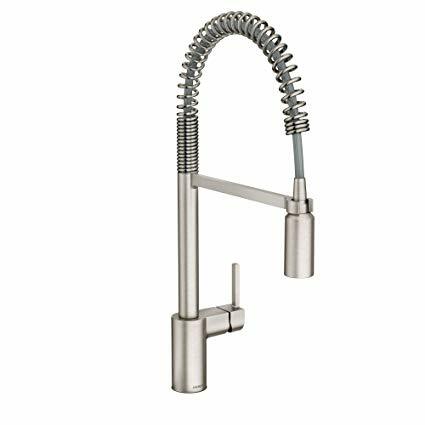 The Moen Arbor Motionsense faucet will blend in with any elegant and stylish kitchen, due to its timeless and sleek design. If you’ve got a busy household full of lots of messy children, Moen’s Motionsense technology may be a real selling point for you since it allows the faucet to turn on, without touching anything. The 68-inch braided hose means you can get to hard to reach areas, with no effort at all. If you’re really style conscious, you can even buy optional extras such as a matching soap dispenser. Staying true to Kraus quality and sleek design, the KPF-1610SS won’t disappoint. If you’ve ever bought from Kraus before, you’ll know their high standards that they always provide. Although some users have reported a leak after having the faucet for a few years, Kraus provide a limited lifetime warranty so if you do encounter any issues, you’ll be sorted in no time. If you find an issue with the electrical side of this faucet, you’ll have a five year warranty to cover you, which is a pretty long time too! There are a number of things you need to consider before buying a faucet and reading some kitchen faucet reviews will really help you decide which style and product will be best for you. The four most popular brands of kitchen faucets that most people opt to purchase are: Delta, Moen, Kohler, Kraus and Grohe. Kitchen faucets generally come in three different styles. The most common type of kitchen faucet is the single handle faucet, this allows for a consistent water flow and temperature adjustments can be made easily with one hand too. Depending on the layout and style of the single handle faucet you choose, it should only require one or two holes for installation. Two handle faucets have two separate hot and cold handles to control the water temperature which most people find easier to use than a single handle faucet. However, having two handles means that installation can sometimes be tricky, so it’s vital you check out some kitchen faucet reviews before buying one. Having a faucet that is touchless will provide you with some fantastic benefits, allowing you mess-free washing, so they’re perfect if you have messy children or if you cook regularly! They also come with adjustable spray patterns and water intensity, so you can adjust it to your needs. Touchless faucets are usually priced a little higher than the other types, however most people agree that their benefits do outweigh the high costs since some of the best kitchen faucets are touchless. 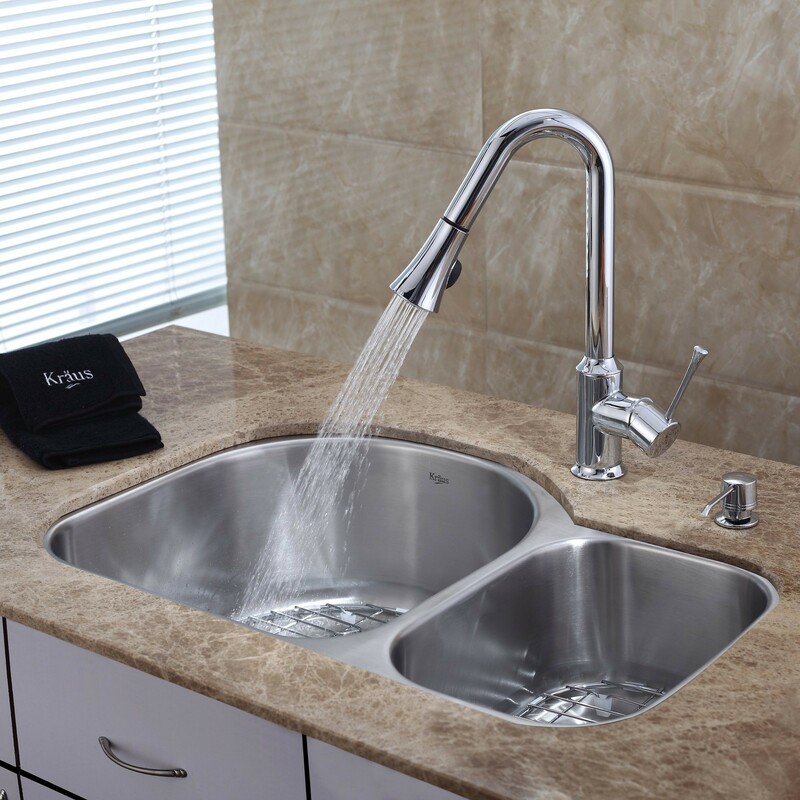 If you don’t have much time on your hands, or you simply don’t want to pay for a plumber to install the faucet for you, you probably want the faucet mounted to the countertop. This is the most common option for households across the world and although it may not look as sleek as a wall mounted faucet, they’re much easier to install. Wall mount faucets might be another option for you, especially if you don’t want to drill holes in your worktop. If you’re interested in getting a wall mount faucet, you need to make sure there are water supplies in the wall above your sink. Though they’re aesthetically pleasing, installation can sometimes put people off getting your faucet wall-mounted however if you find a reputable plumber, you won’t have any problems with it. If you’re buying a faucet for your kitchen rather than your bathroom, a pull out/pull down faucet might be the perfect option for you. Since you can pull the hose out, the hose should be long enough to cover all areas of the sink. That said, if you have quite a small sink, a pull out faucet might not be ideal, since you might be able to reach all areas already. Your sink should already come with mounting holes which have been pre-drilled, ready for faucet installation. Don’t buy a faucet which will require more sink holes than your sink already has, drilling more holes in your counter can result in multiple issues, so stick with what you’ve already got! If you want to add any extra features such as a sprayer or a soap dispenser, you will need an extra hole to accommodate them, so bare that in mind too. Gooseneck spouts look great in any kitchen and they’re great for pot washing, due to their height. If you want to make a statement, check out bridge faucets, these would look great with a traditional kitchen interior however they may not be the most practical, particularly for washing up! Pull up/pull down faucets offer varying levels of water power and pressure whilst also allowing the user to pull the hose out with ease. The spout of a pull up/pull down faucet stretches and then retracts back, either by a magnetic docking system, or a spring-activated mechanism. The pull down style of faucet incorporates the use of a sprayer, creating a seamless one piece design. Kitchen faucets, although designed to be the most efficient faucet in the house, can actually be the worst appliance for wasting water. A leak can end up costing you thousands of dollars to fix and can be caused by a number of issues, such as poor installation. If you’re ever unsure of what you’re doing while trying to install a faucet, it’s vital that you contact a plumber to help you out! If you’re concerned about wasting water, look for the WaterSense® logo when you’re checking out kitchen faucet reviews, this means the faucet has met water saving specifications and it’s designed to produce a maximum water flow rate of 1.5 gallons per minute. The best kitchen faucets on the market should meet this standard which will save you money on your water bill in the long term. The material you choose for your kitchen faucet can be the difference between it lasting 2 years or 10 years. Originally, faucets were made from materials such as brass however it was noticed that most metals were beginning to leak some lead into the water, bringing serious health concerns to the homeowner. This lead to regulations having to be put in place, to limit the amount of lead used in the faucet. Nowadays, companies use a plastic lining for the inside, and keep the metal on the outside of the faucet, which keeps the faucet lead-free. 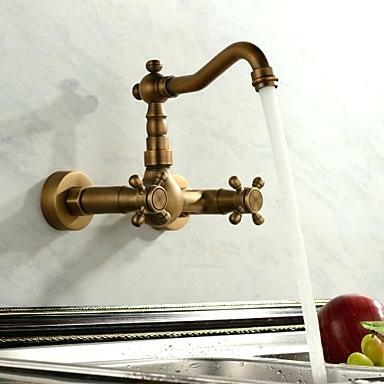 Materials such as brass, nickel, enamel and stainless steel can make for a fantastic faucet which will last a long time, as well as some other added benefits like appearance and versatility. If you’re ever unsure what materials are used, contact the manufacturer or check out some kitchen faucet reviews to learn more. ADA stands for Americans with Disabilities Act. To be labelled as this, faucets need to be able to be used by one hand without twisting or a tight grasp. Hand operated metering faucets also need to remain open for at least 10 seconds. If you buy a faucet that is ADA approved, this means the product meets government standards for accessible design. How do I install a kitchen faucet? 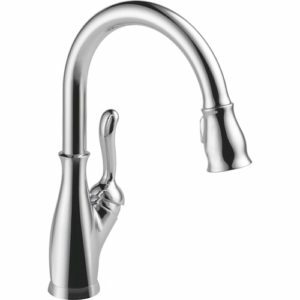 Good quality kitchen faucets should be easy to install but if you don’t have any plumbing experience, you may struggle. 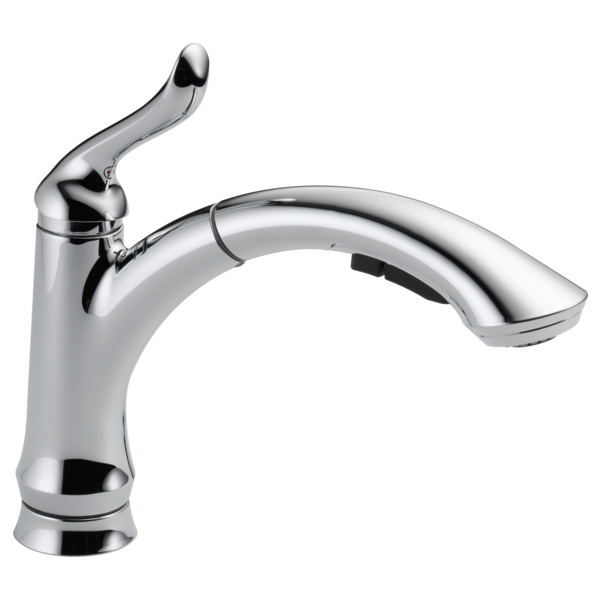 For most faucets, you need to turn the water source and supply lines off before removing the old faucet. You then need to ensure the area is clean and then place the deckplate of the faucet over the holes, ready to be mounted. Reconnect the supply lines and run some water without the aerator first, and then replace it. If you’re ever unsure, contact a plumber or check out some kitchen faucet reviews as they might help and give you some tips for installation. What if my sink has too many holes? Some kitchen faucets can be installed with a decorative plate to cover the holes which aren’t needed. Or, if you’d prefer, you can also buy covers however some people think they ruin the appearance of the faucet and sink area. 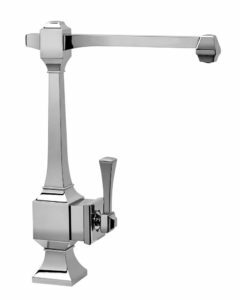 Should I buy a one handle or two handle faucet? What’s the difference? It depends what style your kitchen is! One handle faucets tend to look a bit more modern, so if you have a traditional kitchen and want to keep it like that, two handles might be best for you. If you’re not too worried about the appearance of the faucet, you might even want to opt for a touchless design, depending on how much your budget is! 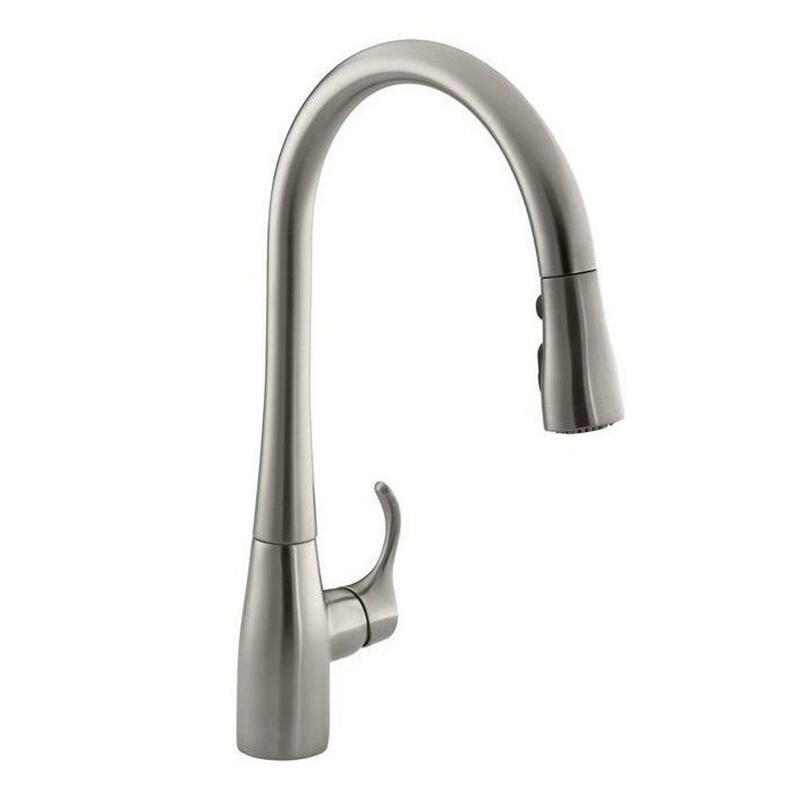 What finishes are best for my kitchen faucet? Chrome is probably the most popular option for people buying kitchen faucets, simply because they match most color schemes well. Steel is also a popular choice, particularly if you hate cleaning water marks, spot resistant steel will make cleaning your faucet much easier. If you have a traditional-looking kitchen, you might consider an oil-rubbed bronze style, which will help keep with the antique look. If you want to have a better look at the color, it might be helpful to check out some kitchen faucet reviews as you might find some pictures on them. PVD (physical vapor deposition) is a fairly new addition to faucets and allows a coating on top of the finish, this prevents corrosion and scratching so if you find a faucet with this coating, it's definitely worth buying it! How much do I need to spend to get the best kitchen faucet? You can find faucets for a range of different prices, starting at anywhere from $30 to over $400! The first thing you need to do is to decide which style and features you’d like your faucet to have. 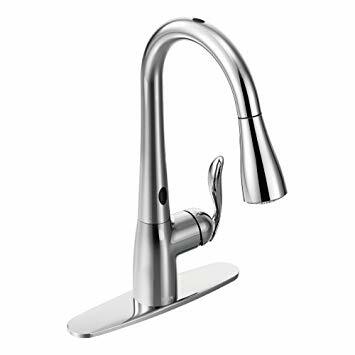 Price doesn’t matter too much as long as you check out some kitchen faucet reviews before you buy one. Durability is the most important thing so keep this in mind when buying, brand name isn’t everything!